END OF SUMMER; NOT THE END OF FUN! I love summer as much as the next guy, but as a tried, and true New Englander; “I’m not afraid!” It breaks my heart to hear ‘those” say “I hate the cold!” My outdoor grill gets more of a work out in winter than it does all summer…..standing over the grill sweating profusely is not all that appetite building. A lazy winter day on the couch watching a movie without having to fire up the AC unit 2 hours previous is a bonus (I refuse to leave my AC units on all the time only to pay the bonus’ of those “mega-watt’ vultures at the power generating stations; err, ah, whoops, I work at the power generating station. Never mind ……..apologies!). In a random twist of fate, my Labor Day plans were to bike with a friend, but the work week beat us down, and the humidity that day was 627% (Hey Zulu, isn’t 100% percent humidity the max, and equated to pouring rain? “Hello……??? Whose story is this? Thank you!!”). Being that my friend is one of my best skiing partners, we did the logical thing; hiked to the Chinese restaurant, and began to plan our annual ski trip. Let’s skip forward. This year we are going to try something new; “Ski Safari!” The idea is to go to Washington State and ski several places that are not conglomerates of the ever-growing mega Vail Resorts. 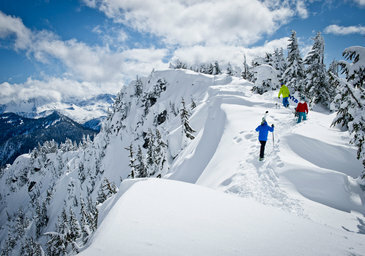 We want to hit Mt Baker, Crystal Mountain, Stevens Pass, and The Summit. Skiing volcanos, and exploring Seattle again has us very excited! I can see it now; Zulu versus the volcano; please don’t erupt on us yet! Standing outside the original Starbucks in Seattle telling anyone who will listen (a select group) to see the light; TEA is the cradle of civilization; not coffee! Taking a ferry ride across Puget Sound; if only to stay onboard and make the return back from anywhere. Knowing in my soul that this was going to be a “wicked cool” trip, I was rewarded from the electronic ether (the World Wide Web), with a nod of encouragement. I came across this video that made me laugh so much. For every kid who climbed a hill only to sled down it; this is for you. Queen Anne Ave. in Seattle is a steep, and very long hill. If nothing else, watch the first 50 seconds of this video. To see the composure of these guys; it cracks me up. It’s as if they were all sitting around someone’s basement and suddenly were “transported” out in a blink of light, and they continued to lounge around someone’s basement. I just love it! Thanks Alohastreetcam………your genius is under-appreciated……..I get that! Mongolian Beef, quality time with friends, and “REAL” couch surfing; I’m ready……..Bring on the cold!!! I’m with you, DD. This morning I put on socks – yay! Gus …… I have an old couch………all we need is snow!